Sorry I'm a tad late this Monday Tuesday morning with my weekly wishes, but today has just been so gorgeous that I couldn't help but get outside. Plus, I'm in the process of packing for my move back to college. Nevertheless, here are some goals/wishes for this awesome week! Try Something New: It's easy to get stuck in a little bit of a rut/routine during the summertime. This week I'm hoping to shake it up by trying something new. My friend just happened to have invited me to try salsa dancing in downtown Little Rock this upcoming week, so I'm giving it a go. Ah! Fingers crossed for me that I don't totally humiliate myself! Get Packing: I'm moving into my new digs Friday! This week is going to fly by and there's still sooo much stuff to pack. Where did all of these clothes come from?! Seriously. So this week I aim to get packed up to completion. Write: I've been neglecting my personal journal all summer. It's definitely time to change that! Drink More Water: I feel like I strive for this every week, but I especially need to this week. I'll be loading, lifting, and doing all sorts of things outdoors. Hydration will be key! What are your goals/wishes for the week? I need to get back on my journal too. 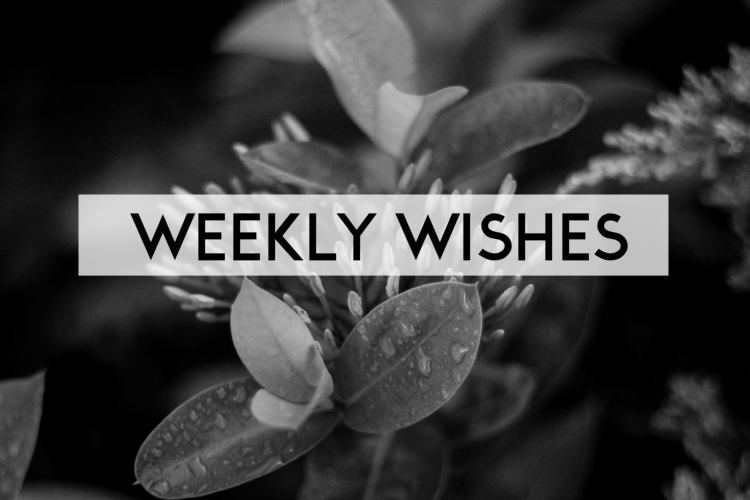 Good luck for your wishes this week!